PV Sindhu cemented her position as a dominant force on the world stage with an Olympic silver medal while Saina Nehwal continued to battle with injuries in a year which saw Indian badminton take giant strides at the global platform. It turned out to be a watershed year for Sindhu, who reached the upper echelons of world badminton with a silver medal at the Rio Games – an achievement also for her mentor and chief coach Pullela Gopichand, who became the only Indian coach to produce two Olympic medallists. On the other hand, for the first part of the year, it was Saina's battle with injuries which dominated the headlines even though she was considered to be the best bet for India at Rio. The Indian ace fought against time to recover from an Achilles tendon injury and went on to win the Australian Super Series. Despite her two bronze medals at the World Championship, Sindhu, meanwhile, was considered one of the hopefuls but not a serious contender for the gold medal, partly because of her early exits from tournaments in the run-up to the Games. But the Olympics had contrasting fates awaiting the duo. While Saina exited in the second round and later it came to light that she had a bone chip floating inside her knee area, Sindhu went on to become the first Indian shuttler to win a silver at the Games and with the feat she finally stepped out of Saina's shadow. Besides the Olympic feat, Sindhu also etched her name in history books, becoming only the third Indian to win the China Open, her maiden Super Series Premier title and then reached the finals at Hong Kong Open and finished as semi-finalist in her debut World Super Series Finals at Dubai. "It has been a fantastic year for me, because winning a medal at the Olympics is a big achievement. It's a dream come true. Also, I always had in mind that I wanted to win a Super Series title and that also was fulfilled (at the China Open)," Sindhu said. "Definitely, the aim is to become No 1. I have achieved my career-best six, so I am really very happy. I wish this can continue and I can continue improving further." Besides Sindhu's meteoric rise, Saina clinching the Australian Super Series and K Srikanth reaching the quarterfinals at Rio and winning the Syed Modi International championship at Lucknow, HS Prannoy bagging the Swiss Open Grand Prix Gold at Basel were the highlights of the year in which Indian badminton achieved unprecedented success. In men's singles, Sourabh Verma recovered from a long injury lay-off to bag the Chinese Taipei Grand Prix and finish runners-up at the Bitburger Open. B Sai Praneeth also won his maiden title at the Canada Grand Prix and Sameer Verma crowned himself the senior national champion before finishing runners-up at the Hong Kong Open and Ajay Jayaram finished runners-up at the Dutch Open Grand Prix. Indian badminton also made new breakthroughs in the season gone by with the men's doubles pair of Manu Attri and B Sumeeth Reddy winning the Canada Open and becoming the first Indian men's pair to qualify for the Olympics. The mixed doubles combination of Pranaav Jerry Chopra and Sikki Reddy also had a memorable year as they won two Grand Prix titles at Brazil and Russia and finished runners-up at the Scotland Open. The young Ruthvika Shivani Gadde also claimed the women's singles title at Russia as India continued to tick the right boxes. The Indian women's team clinched a bronze medal for the second time after suffering a 0-3 defeat at the hands of defending champions China in the semi-finals of the Uber Cup at Kunshan in May. While Jwala Gutta and Ashwini Ponnappa also made it to the Olympics for the second successive edition, the year saw the celebrated women's doubles pair split early last month and pair up with Manu and Sikki respectively for women's doubles and mixed doubles respectively. There were also others such as Commonwealth Games champion P Kashyap and Glasgow bronze-medallist RMV Gurusaidutt, who battled throughout the year to get back to full fitness. 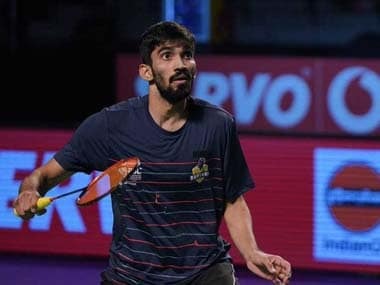 Fitness issues also spoilt the performances of Srikanth, who suffered an ankle injury at Japan Open and was ruled out for the rest of the year, and Prannoy, who had recovered from a back issue and toe injury only to hurt his back again during the Macau Open. "It's been a challenge year for men shuttlers. Many of them have played many tournaments, trying to qualify for the Olympics, that actually somewhere made dents in their fitness," Gopichand said. "We had Sameer and Saurabh Verma do well. They could have been more consistent, but they all have played very well in different times and it augurs well for Indian badminton. Hopefully, we will get consistency (in future)," he said.